Ok, so I’m going try to use as few exclamation points as possible while writing this. I’m always searching about for music with that grand cinematic feel for those huge moments in game, either final confrontations with the big evil villian or for describing a larger-than-life scene, little did I know it was all together on one album. 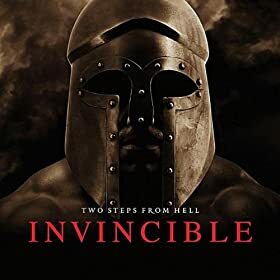 Two Steps from Hell’s Invincible is an album full of movie trailer music, the kind of music that is fast paced, hard hitting, and makes you go “WHOA! I gotta see that film!” There is no room for subtlety, no time for calm moments and slow build-ups. I could very easily add just about every song on this album to the Epic Battle Playlist. If you run your game with a cinematic feel and love to engross your group in descriptions than you NEED this album!